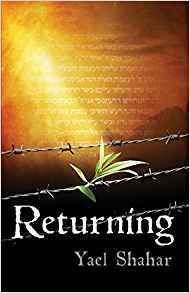 Returning is an extraordinary and challenging book on many levels. It attempts to make the intangible as close to tangible as possible. It engages readers in a kind of time travel that has nothing to do with science fiction. It might remind some of paranormal romance, but the stakes are much higher. What genre does is belong to? Author Yael Shahar once thought of calling it “fiction memoir,” but that does not capture enough of its essence. The workings of dreams are central to the book’s technique and meaning, but what if you dream someone else’s dreams? What if someone else dreams yours and remembers yourmemories? Shahar’s artistry is to make these “what-ifs” credible and meaningful; in fact, inevitable and necessary. She imbeds these actualized possibilities in a theological — or, at least, a biblical — context. The primary character is an older man named Alex. He is a tormented, guilt-ridden soul who has lived in Israel for many decades following his escape from slave labor at Auschwitz-Birkenau. A Greek Jew from Salonika (“Saloniki” throughout this book), Alex, whose given name is Ovadya (servant of God), was part of a sonderkommando crew, mostly Jewish, who were worked to exhaustion day after day hauling away the bones and ashes of incinerated Jews and other doomed prisoners. All of his adult life, Alex has been trying, without much success, to resist the constant pressures of memories that take him back to his sonderkommando experience, a trauma that he’d like to forget. As an unwilling witness and assistant to the obliteration of his people, Alex is a man with a diseased soul. Part of him knows that he must face his past and accept responsibility for actions taken and not taken. He seeks the help of Rabbi Ish-Shalom (“man of peace”), a person of remarkable learning, wisdom, and sensitivity. The rabbi becomes a spiritual coach who leads Alex on the path of self-knowledge, atonement, and redemption. But this is not a feel-good journey; it is filled with harrowing confrontations with Alex’s younger self. The rabbi insists, through a series of questions and refutations of Alex’s answers, that there are times when the giving of one’s own life may be the moral choice. Alex’s resistance to his job of making room for the next victims to be pushed into the gas chambers would not have saved those lives, but that defense is slowly taken away during his conversations with the rabbi. As Alex releases his memories, first by writing them down and later by speaking them aloud, he undergoes renewal and revelation that properly elevate his sense of self. He can take back his given name because he earns his right to it. Yael Shahar as a character in her book is an intermediary between Alex and Rabbi Ish-Shalom. She brings them together. In a literal sense, with her name given as author of the book, she is telling Alex’s story — including his dialogue with the rabbi. . . .